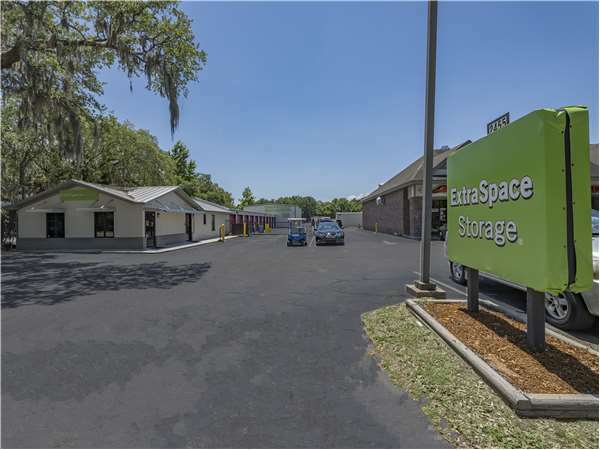 Located on Ashley River Rd just north of Dogwood Rd, Extra Space Storage serves Charleston residents near West Ashley, North Charleston, and more. Locals will recognize our facility behind Pizza Hut a few minutes south of Riverpointe Christian Academy and CVS. Extra Space Storage on Ashley River Rd offers a wide selection of storage units, climate-controlled storage, vehicle storage, and more! We're the storage solution you can depend on in Charleston near West Ashley! Our Charleston storage facility has units ranging from 25 square feet up to 300+ square feet, so it's easy to find the space that fits your needs. We also have units with drive-up access, indoor access, and more! At Extra Space Storage, we're committed to providing a safe environment for customers. That's why our facility is equipped with an on-site resident manager, 24-hour video surveillance, and electronic gate access. With Charleston's heat and humidity, we recommend storing delicate items in a climate-controlled unit. These units stay between 55 and 80° year-round to prevent damage to your belongings. If you're looking for vehicle storage in Charleston, Extra Space Storage has the solution for you! We offer outdoor parking spaces and enclosed drive-up units that can handle vehicles from motorcycles to RVs. With a well-maintained and secure facility, affordable rates, and a friendly team, Extra Space Storage is the industry expert you can trust for your storage needs. We're committed to delivering great service, and we'll go the extra mile to ensure your needs are met. Contact us today to reserve a storage unit in Charleston! Great service. Kyla on ash river has been super helpful. Shannon and phillip on stockade lane in mt pleasant are great. Great companies are made by great employees. very helpful finding available storage near me that met my needs. Got the process rolling on-line and finished the paperwork at the facility quickly. Great staff and a secure location. The whole staff is great & Amanda is that person you could chat w/over coffee. Such a great team at this location. This place has all of the options you need for storage. 24/7 access, large bays, easy access, friendly and available staff who are on point! Store manager Amanda was extremely helpful, flexible and accommodating. She offered options to solving my delivery issues from an out of state moving company to everyone’s satisfaction. DEFINITELY would recommend!! Nice clean facilities and helpful staff.. Friendly staff, reasonable rates, clean and secure facility. Take Ashley River Road (State Route 61) South towards Magwood Drive. We are located about a quarter mile past Woodland Road on the right hand side. We are next to the little shopping center that has Pizza Hut and right before 3 Matadores Tequilaria. Take Ashley River Road (State Route 61) North. Bear to the right when the road forks with Paul Cantrell Blvd to stay on Ashley River Road. Pass Bear E Patch Café. Continue on Ashley River Road and pass Sunflower Café on your right. We are located on the left side of the road just past 3 Matadors Tequilaria and right beside Pizza Hut. Or coming for Savannah Highway, take 526 towards Mt. Pleasant. Take the Glenn McConnell Parkway exit. Turn right after the Chick-fil-A onto Magwood. Turn left onto Ashley River Road. We are about a mile down the road on the right next to Pizza Hut. Take Interstate 526 towards Savannah. Take the exit for Glenn McConnell Parkway. Turn right onto Magwood. (Chick-fil-A and Home Depot intersection). Turn left onto Ashley River Road and we are about a half mile down the road on the left just past 3 Matadors Tequilaria and right beside Pizza Hut. Take Glenn McConnell Parkway toward Interstate 526. Make a left onto Magwood at the shopping center with Foodlion and Home Depot. Make a left onto Ashley River Road. We are on the left just past 3 Matadors Tequilaria and right beside Pizza Hut.